Just in the last four years, 60 more players hit 20+ home runs in 2017 vs 2014. That is more than DOUBLE the total that year (57)! No season had ever seen more than 93 players hit 20+ home runs before 2016 & 2017 both surpassed 110! 40 players hit 20 home runs for the first time in their career in 2017. 10 of them were rookies. In 2016, we saw 19 players eclipse 20 home runs for the first time and six of them were rookies. 2006 & 2008 were the only other years 5 or 6 rookies hit 20 home runs. 30+ home run hitters have nearly quadrupled since that year, with 41 players hitting at least 30 home runs in 2017 while just 11 did in 2014. The interesting thing is that we have not seen an increase in 40+ home run hitters. We are seeing them at half the rate we did in the early to mid 2000's. From 2002-2006, the MLB averaged 9.4 hitters with 40+ home runs. 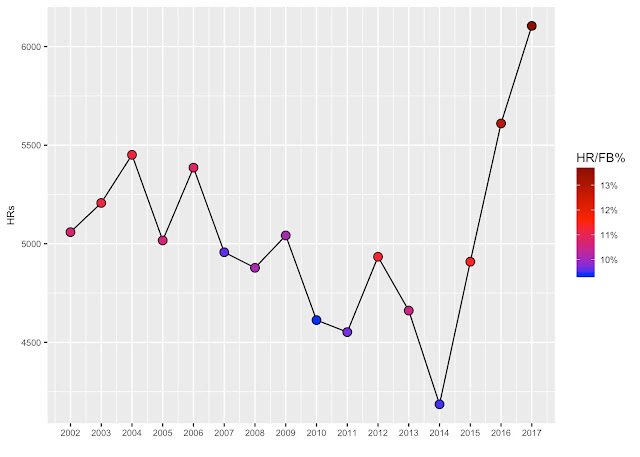 Since the 2007 season - 4.3. Even if your ignore the 2014 season, when Nelson Cruz led the MLB with 40, the average only jumps to 4.6. Aaron Judge and Giancarlo Stanton's 50+ home runs in 2017 matched the total number of hitters with 50+ home runs since 2007! Jose Bautista (2010, 54) and Chris Davis (2013, 53) were the only players to hit 50 home runs between 2008-2016. 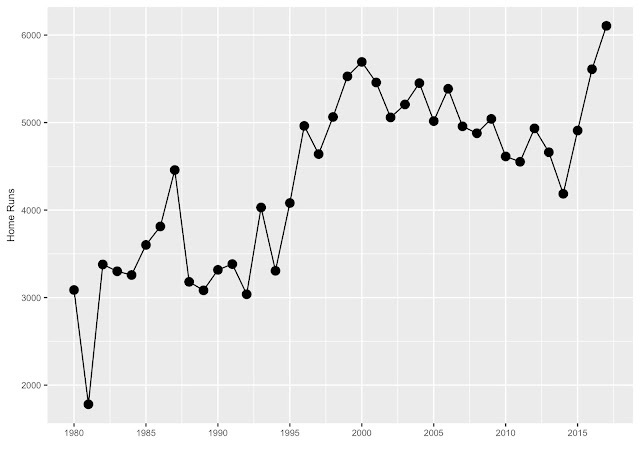 The 2014 MLB season was something we had not seen since 1995, which actually was the most home runs hit since 1980, outside of 1987! In 1995, Albert Belle hit 50 home runs. He was just the 2nd player to do so dating back to 1980. The other? Cecil Fielder (51, 1990).